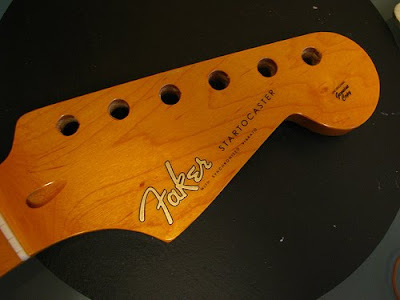 Meet the "Faker Startocaster"; a home DIY project by Ross Edwards in London, submitted by loyal reader, Nigel. 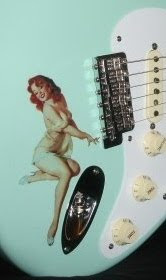 Aside from the clever headstock decals done by Ross himself, the Strat is a nod to the David Gilmour owned 0001 which is supposed to be Fender's very first production Stratocaster. Ross's blog has lot's of details. Be sure to click all his post footer tags, as he's written various blog posts about the project under different category tags, including how the decals were created-- and how he matched the paint. Although our UK readers won't have any problems, you'll also have fun sorting through Ross's occasional British expressions and terms i.e. "dead chuffed" and "cocked up". Thanks again to Nigel (a fine Brit name!) for contributing to this week's Friday Strat! 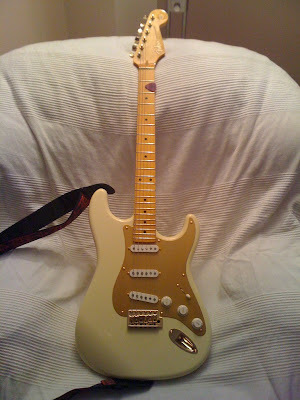 And NO, this Strat is not for sale or listed at eBay.